Photo: Courtesy of Fox Fodder Farm. Flower arranging always seemed a bit intimidating to us — like a ritual better left for ladies with country estates and lots of spare time. 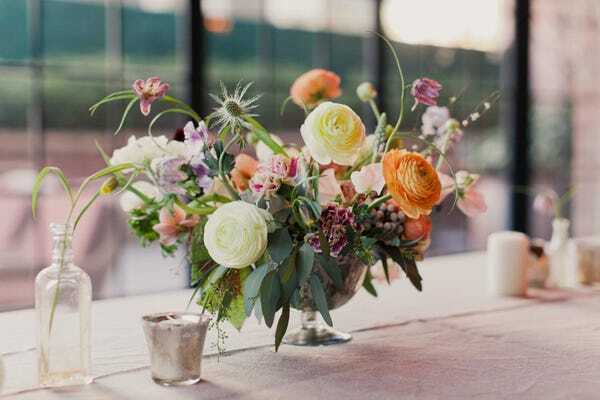 Then, we spent a morning with Taylor Patterson, founder and CEO of Brooklyn's Fox Fodder Farm, at the Canvas Home store, and learned that bouquet-making definitely doesn't have to be a fussy affair. Fox Fodder's arrangements are sweet, spirited, and a bit on the wild side, which explains why the team was tapped to jazz up runway shows for Honor and add that something new to jewelry designer Pamela Love's big day. With the step-by-step tricks below, you'll have a vibrant, imperfect bouquet all your own. Also, on a totally unrelated note, Mother's Day is May 11. 2. Pick your fillers. Start with a green base plant, like spiraea, and start placing in the grid facing different directions. "There are a lot of varieties of spiraea, the one we love has a lot of pretty, white flowers." 3. Clean off the lower foliage. "You don't want there to be any leaves at the bottom of the vase because that will create bacteria. Your flowers won't last as long, and that's always a bummer." 4. Cut your stems. "Snip on an angle and it creates more room for the stem to take up water. 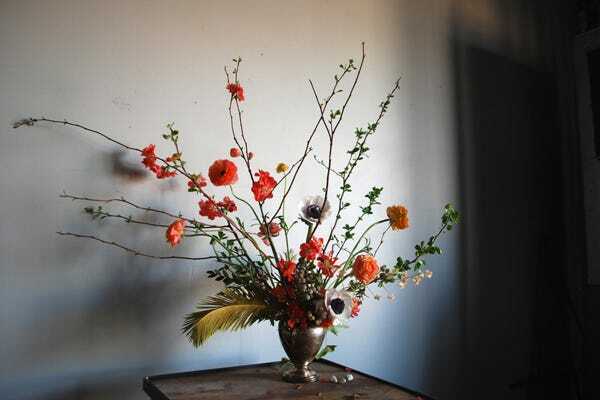 When cutting flowers at different heights, hold each one next to the vase and see where the bottom will hit." 5. Choose your face flowers. "These are the big blooms, the showstoppers that occupy the main part of the arrangement. Use them in groups of three or five. Look at the shape of your arrangement and see — before you cut — where you might want to put it. You want to cut at different heights to give dimension. One of the things people do is cut everything at the same height and then shove them in. You have a mess and it feels dense and thick. It's nice to let them have their own space to breath." 6. Add your accent flowers. "You can use a lot or a little. I always veer toward the simpler. A good rule of thumb is to keep them with their friends — the columbine together, the lavender together, etc." 7. Play with asymmetry and spin your vase. "Maybe have it taller on one side or reaching out more on another. Or, have one random thing jut out. We're all guilty of getting attached to one side and then you realize you made an one-sided arrangement, which is great if you're going to put it against a wall." 8. Fill in. "Use any leftover tiny pieces of spiraea to tuck in and cover the tape (or fill in bare areas)." 9. Give them love. "Prolong the life of your blooms by changing the water every day and recutting the stems." Voilà, your desk just got a major upgrade. Not your fault if your coworkers spend the afternoon wondering where you got a secret admirer with such good taste.